Though the Pocono Mountains are a year-round destination, we can’t help but fall in love with spring in the Poconos. The spring season brings about blossoming trees and flowers and temperatures perfect for exploring the outdoors. Celebrate spring in the Poconos with biking, hiking, scenic driving tours, and more. To top off your spring getaway, we would love to host you here at The Settlers Inn. We have quite a few upcoming spring events you’ll want to experience. From our Easter Dinner to our Spring Wine Dinner, there’s plenty to do to help you celebrate. Once you have decided on how to celebrate spring in the Poconos, don’t forget to download our Delaware Highlands Vacation Guide. This free guide makes planning your getaway a piece of cake! You’ll receive great tips on places you’ll want to visit, information on upcoming festivals, and tips on outdoor recreation offered in the area. Download our free guide to take advantage of all the wonderful things the Pocono Mountains has to offer. Once the time comes to shed our winter coats, we definitely want to go outdoors! From a simple stroll through Bingham Park to the search for the perfect waterfall, the Pocono Mountains have something for everyone. One of our favorite places to spot a waterfall is at Dingmans Falls in Delaware Water Gap National Recreation Area. The park is free and offers a great location for a spring picnic. You’ll be able to spot two waterfalls while you’re there. And there’s no need to leave your dog behind on your adventure. There are quite a few dog-friendly trails here in the Poconos, as well. Did you know that while you’re visiting, you can take part in the Hawley BikeShare Program? Through this program, bikes are loaned out for free, and you can grab some right outside our doors! If you do choose to go out for a ride, check out our two area bike tours. Our Innkeepers have compiled two tours: the Lackawaxen River Ride and the Wayne County Scenic Ride. You might have to just try them both! With trout season coming up, it’s hard not to get excited about fishing on Lake Wallenpaupack. With everything from bass to walleye, perch, and trout, there are many kinds of fish to look for. If you choose to fish from a boat rather than the shore, check out a power boat rental from our sister property Silver Birches Resort. Their fishing boat rentals range from $175 for a half-day to $275 for a full-day rental. We love that when guests stay with us, we can offer them a farm-to-table restaurant for breakfast and dinner. Our award-winning restaurant uses fresh local ingredients when making the delicious seasonal menus. This spring, we will be celebrating Easter Dinner, Mother’s Day Brunch or Dinner, and Memorial Day with a brunch celebration. You will dine on Executive Chef Ben Sutter’s creations while sipping on mimosas and our signature Bloody Marys. If you feel like you’ve got spring fever, let us help you cure that feeling with a stay in one of our cozy guest rooms. When traveling here in the spring, may we suggest a stay in Room 304? 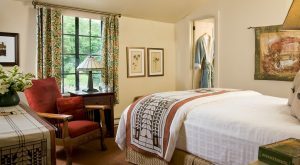 This beautiful room features a queen bed and views that overlook the Inn’s beautiful blooming garden. A full country breakfast is offered with each overnight stay. Our sister property, Silver Birches Resort is another great location to celebrate spring. Just a few of their amenities include lawn games, fire pits, poolside food and beverage service and a pass to Lake Region Fitness. And with all of the buildings facing Lake Wallenpaupack, the views are definitely going to be worth it! Come and celebrate spring in the Pocono Mountains with us! We hope to see you very soon!